Shifting your things from one home to another has never been easier than with us at Moving Service! Whether you are moving to Goodmayes, IG3 for business or you are moving house, we have all you need to ensure a smooth move. As a removal company in IG3, we have been in the business for many years, delivering top-quality house removal services to thousands of home owners and business owners throughout London. We have on-board with us a professionally trained team, as well as some of the best deals. If a professional removal service is what you need, act now and call us on 020 8746 4402! What Exactly Can Our Goodmayes Moving Team Do For You? 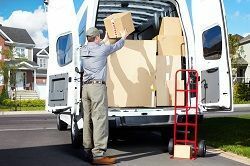 As the top removals company in this line of business, we can offer you more relocation services than any other competing company. Hire us for removals to Goodmayes, IG3 and we can take care of all packaging, making sure that we box all your stuff up and safely secure it all. With us on this job is our team of fantastic movers, who are all experienced and fully trained for the work. Form office relocations to house removals, we have you covered! We also offer a same-day service, so if you need us to get to your home or business in IG3 as soon as possible, we can begin your services on the same day you make your booking. Call us today on 020 8746 4402 to find out more about our removal services and prices. An additional service which we do not charge for, and which we are proud to declare, is our eco-friendly service. Like any modern company, we have the health of the environment in mind, and by hiring us for your removals to Goodmayes IG3, you can do your bit for your environment. On our travels, we make sure to use as little fuel as possible. In addition, we use only cardboard boxes and packaging which we can recycle. You won't have to pay any extras for this work – consider it an added incentive on our part. With us at Moving Service, you get so much more than a removals service, so book today on 020 8746 4402. What's Life Like In Goodmayes? Located in north-east London, Goodmayes is a suburban district which belongs to the London Borough of Redbridge. The area has around 13,000 residents and it is situated approximately 11 miles from Charing Cross. The area is known for its Scout clubs, in particular, 4th Goodmayes, and also some parks – most notably Goodmayes Park. The area has both retail stores and supermarkets, such as Aldi and Tesco Extra, and the Mayfield Secondary School. The area also has its own station – Goodmayes railway station, which is served by Tfl Rail, and the nearest London Underground railway stations are Newbury Parkand and Barking tube stations. Do You Know That We Have the Best Priced Moving Services in IG3? The reason why we are currently one of the top removal companies in Goodmayes, IG3 has a lot to do with our amazing prices. We will not be unbeaten on price and you can hold us to that promise – no removals company in Goodmayes, IG3 can outdo us on price! On top of our great prices, we have many discounts and offers to sweeten the deal further. We are experts on flexibility, and we can stretch prices and discounts as far as we can in order to guarantee complete customer satisfaction. Call us now to hire our services and we can customise a package to meet your budget. Start saving money today with us!